This has a large globular body with thick, sharply bent or oval shaped handles; short neck often with an internally concave rim and a small basal knob. This form clearly developed from the Augustan prototype Oberaden 83 and eventually evolved into the smaller Tejarillo 1. A broad scheme for the evolution of the Dressel 20 rim has been suggested by Berni (1998), provided under 'Drawings'. This form is commonly stamped towards the summit of the handle, with the name in relief set in a rectangular frame. This is usually an abbreviated name of an individual, presumably the estate owner although place-names are also encountered (Remesal Rodríguez, 1986). It also includes complex painted inscriptions indicating amphora weights and individuals responsible for transport and control (Rodriguez Almeida, 1984). From the third century there is evidence of imperial ownership of some of these estates. The typical globular form was introduced by at least the Tiberian period (Xanten) and became established by the Claudian period (Colls et alii, 1977). Production continued up to the second half of the third century (Zevi, 1967, Blázquez Martínez & Remesal Rodríguez, 1999; 2001; 2003) (Monte Testaccio). In the western provinces it is the most common amphora from the late first to the early third centuries AD (Williams & Peacock, 1983, Remesal Rodríguez, 1986). Along the banks of the river Guadalquivir and its tributaries between Seville and Córdoba in the Roman province of Baetica (Clark-Maxwell, 1899; Bonsor, 1931; Ponsich, 1974, 1979, 1991; Chic, 2001) in southern Spain, where kiln sites have been discovered (Click to map in Introduction). A graffito from Carlisle reads ESVRI (Vila Real de São Antonio) on the Algarve of Portugal (Mann, 1955), but the fabric is identical to the Spanish material. The vessel was imitated in Hispania Tarraconensis, along the coastal strip of Baetica and in Germania (Baudoux, 1996; Ehmig, 2003). 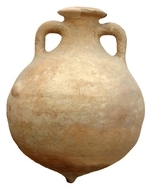 This is one of the most common and widely distributed of all amphorae, especially in the western Roman provinces (Callender, 1965; Panella, 1973; Williams & Peacock, 1983, Remesal Rodríguez, 1986; Martin-Kilcher, 1987; Berni, 1998; Carreras Monfort & Funari, 1998). It was chiefly concentrated in military sites along the German and British limes as well as the city of Rome (Rizzo 2003: 141-198), where excavation at Monte Testaccio reveal the scale of its importation (Blázquez Martinez, Remesal Rodríguez & Rodríguez Almeida, 1994; Blázquez Martinez & Remesal Rodríguez, 1999; 2001; 2003). Olive-oil (Callender, 1965; Beltrán Lloris, 1970; Panella, 1973).